The AIIA’s National Director and researchers have produced the first-ever book length discussion of the role of think tanks in diplomacy. Think Tank Diplomacy, published as part of Brill’s Diplomacy & Foreign Policy series, explores the role of think tanks in the evolving world of modern diplomacy through a series of case studies from across the globe. If a key aspect of diplomacy is how countries are seen abroad, official diplomats are not the only actors. In contexts as diverse as Syria, Myanmar and the South China Sea, think tanks are influential actors whose impact deserves greater study. As organisations producing independent intellectual outputs to influence public policy, think tanks engage in at least four diplomatic functions: negotiation, communication, information-gathering and promoting friendly relations in international affairs. Detailed case studies show that think tanks both directly perform and indirectly support diplomatic functions: as metaphorical hired guns, charm offensive, witnesses and safe space; as a school for diplomats, personal trainers, chief knowledge officer and wise counsel. To reach their full potential, think tanks need to overcome obstacles including resource constraints and relationships with policymakers. 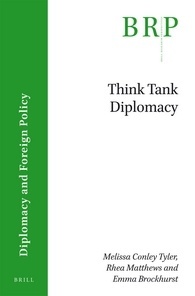 Think Tank Diplomacy is available for purchase from the AIIA National Office for AUD$99. To purchase please fill out an order form and email to Rohan.Caldwell@internationalaffairs.org.au.